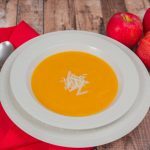 With a nutty, sweet flesh similar to pumpkin, the butternut squash is a commonly available winter squash that can be found year-round and used in a multitude of ways. The pale yellow/orange skin is smooth, making it easy to peel. The bright orange flesh is high in vitamins A and C and can be sliced or chopped for use in soups, stews, casseroles or enjoyed on its own. The purée can also be added to bread doughs, pie fillings and muffin batters. Although different varieties of butternut squash are available, they vary little in appearance and are not sold by variety (like apples are). They all have a smooth pale skin with an orange flesh, and the deeper the orange flesh, the sweeter the flavour. Common butternut squash varieties are the Waltham, the Butter Boy, the Burpee’s Butterbush and the Autumn Glow. Look for a smooth skin, free of bruises or cuts which could lead to early decay. Pick them up and choose one that feels heavy for its size. The stems should be attached and dry. A pale spot where the squash rested on the ground in the field is fine, but it shouldn’t be green, which would indicate it was harvested too soon. Although you can store this squash in your fridge, it is not necessary. It can be stored in a cold room (approx. 10-13°C) for up to two months before consuming. Moisture can cause bacterial growth so it’s important to keep the butternut squash dry with sufficient space for air circulation around it. Sometimes tree fruit such as pears and apples can release ethylene gasses which shorten the shelf-life of your squash, so store them separately. Cut through the squash to separate the neck from the bulb. The bulb end has the seeds while the neck end has the stem. The smooth skin makes peeling a butternut squash much simpler than squashes with an uneven surface. Rest each half of the butternut squash on its flat, cut surface and using a vegetable peeler or sharp knife peel the squash in a downward motion. The squash does not need to be peeled before roasting, but it is simpler to peel if boiling for a purée. The bulb end should be cut in half to scoop out the seeds with a spoon. The seeds are usually discarded but are also edible. If desired, rinse and dry the seeds then toast on low heat in the oven like pumpkin seeds to be used in muffins, granolas or as soup garnishes. To steam: Peel the squash and remove the seeds. Slice the squash or chop into bite-size chunks. Place in a steamer basket over boiling water for 20 to 30 minutes until fork tender. To boil: Peel the squash and remove the seeds. Slice or chop into bite-size chunks. Fully submerse in water, then boil for 20 to 30 minutes until fork tender (the smaller the pieces, the faster they will cook). Drain using a colander. To bake: Peel the squash or leave unpeeled. Remove the seeds. Slice or chop into bite-size chunks and spread out on a baking sheet lined with parchment paper. If desired, brush with a little oil and season with salt and pepper. Bake in a preheated 400F oven for 30-45 minutes until fork tender (again, the smaller the pieces the quicker they will cook). To microwave: Peel the squash or leave unpeeled. Remove the seeds. Slice or chop into bite-size chunks. Spread the squash pieces out on a microwavable plate. Cook on high in 5 minute intervals for about 7-10 minutes until fork tender. Cooking times will vary depending on the power of your microwave and the size of the pieces. Peel the squash and scoop out the seeds with a spoon. Chop the orange flesh into bite-size chunks and spread out in a single layer on a baking sheet. Place the baking sheet in the freezer until the squash is frozen. Transfer to a labelled freezer bag and store in the freezer for up to 6 months. You can also steam, bake or microwave butternut squash first before freezing, and the purée can be kept in freezer bags or containers as well. Butternut squash is a favourite baby food for its smooth texture and sweet flavour. Plain cooked and puréed squash can be frozen in ice cube trays to be reheated in small portions as needed. Try it combined with puréed apple, pear, carrot, sweet potato, chicken or beef. 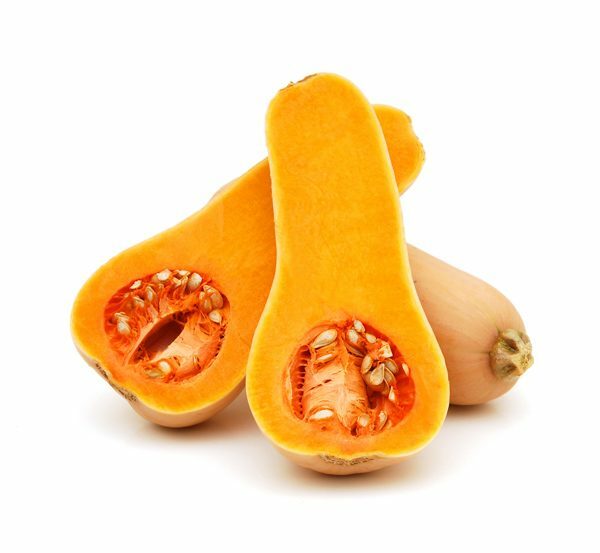 Since butternut squashes can be large or small, consider choosing a large one and putting the leftover chunks in the freezer for quick additions to soups, stews and pasta dishes another time. Since they can be stored at room temperature for some time, enjoy the beautiful bell shape of butternut squash as a table decoration with other beautiful winter squashes of different sizes, shapes and colours. Squashes are heavy and make attractive bookends for your cookbook collection. Keeping them on display will also remind you to prepare them more often. According to the Canadian Nutrient File, 100 g of baked butternut squash contains a great number of your daily-recommended intake of nutrients: 130% of Vitamin A, 25% of Vitamin C, 12% of magnesium, 8% of potassium, 8% of folate, 7% of fibre (1.5 g), 7% of Vitamin B-6, 5% of niacin, 4% of calcium, 4% of iron, and 3116 µg of the antioxidant beta cryptozanthin.